Hard by the famous City of the Mosque, rightfully regarded as one of Spain’s sightseeing highlights, lies an area that is less well known but just as valuable in its own way: the Córdoba portion of the Sierra Morena mountain chain. From the deep gorges of the River Retortillo to the celebrated valley of Yeguas stretches off an endless succession of hills, dales and rivers that harbour a wealth of natural treasures. Unspoilt swathes of Mediterranean woodland and scrub are stalked through by Iberian Lynxes and overflown by barking Imperial Eagles, soaring alongside Golden Eagle, Cinereous Vulture, Short-Toed Eagle, Black Stork and Red-Rumped Swallow. Amongst the rocks, crags and gorges nests the magnificent Bonelli’s Eagle, heading an impressive supporting cast of other rock-nesting birds like Griffon Vulture, Alpine Swift, White-Rumped Swift, Eagle Owl and Blue Rock Thrush; the ground below them in spring is bedecked with diverse narcissus species and the Giant Orchid. In the river- and streamside copses and thickets of Ash, Alder, Poplar, European Nettle Tree and Oleander live Golden Oriole, Nightingale and Hawfinch, the threatened dragonfly Orange Spotted Emerald or the singular Nettle Tree Butterfly. Along the pristine watercourses swim Otters or herps like Iberian Midwife Toad and Southern Marbled Newt plus endemic fish species so rare and local they have no English names, like jarabugo, colmilleja and calandino. In the vast pine woods breed Redstart, Crossbill and Iberian Chiffchaff, while displaying Booted Eagles swoop overhead and Goshawks dash between the trees. To the south the hills roll more gently towards the confining belt of the River Guadalquivir, which adds a note of variety to the otherwise woodland fauna in the form of Purple Swamphen, Purple Heron, Night Heron, Little Bittern and Bluethroat, as well as rarities like the dragonfly Orange-Winged Dropwing. 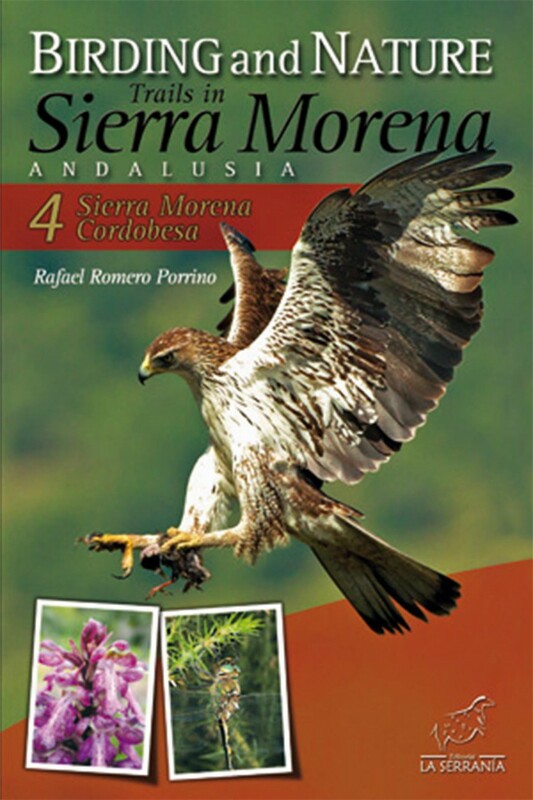 In these pages readers will find 15 nature-watching outings of varied type (car drives, treks, family-friendly strolls and fixed lookout points) and different degrees of difficulty, allowing both expert naturalists and rank beginners to enjoy the splendid flora and fauna of Sierra Morena Cordobesa.